Chelsea have won their first five Premier League games under Maurizio Sarri and the change of style is clear, explains Jamie Carragher. Long before Maurizio Sarri's protracted appointment as Chelsea head coach was confirmed, the speculation had already begun about how the Italian might transform the team. Five games and five wins have won over any Stamford Bridge doubters but the evidence of change was there before a ball was even kicked. It showed itself in the first kick-off. "The first thing his team did in the Premier League was away at Huddersfield with the kick-off and you look at it and think, OK, that's different," Jamie Carragher explained on Monday Night Football. "You had seven players almost on the halfway line. "The reason I liked it is that I am sick of teams taking the kick-off and ended up back with their own goalkeeper. You have got the ball on the halfway line. Look to go forward. "They are already on the front foot. They have actually taken nine kick-offs, Chelsea, and there is only one where they have not done that. At least there is a plan. People think they are a waste of time and they are not important. They are important and if you can gain an advantage from it then fantastic." Of course, there is much more to Sarri's changes than kick-offs and that shines through in the statistics. Chelsea currently rank top of the Premier League for possession, successful passes, passes in the final third and the number of sequences of 10 passes or more. They did not rank among the top four in any of those metrics last season. It is indicative of the change of approach - a change that is personified by Jorginho. The Italy international was signed by Sarri in the summer from his old club Napoli and has been at the heart of things for Chelsea. Jorginho tops the Premier League stats for touches of the ball and successful passes so far. "He looks a class act," said Carragher. "When a manager comes in you can already tell his style if he goes with that type of player in the holding midfield role, a passer rather than N'Golo Kante who is more someone who can break things up. He has moved Kante's position to get him in there and I think that shows how he wants to go forward with the team." Jorginho is more than a mere passer. "He is already ordering players around," adds Carragher. "He is Sarri's man, he is the coach on the pitch." 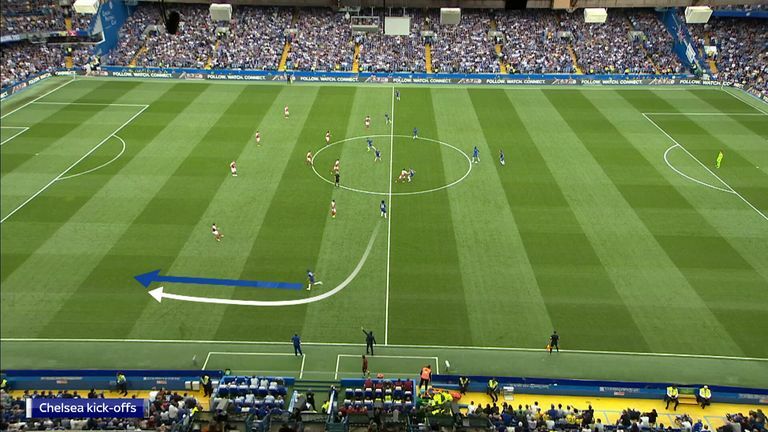 And that means instructing his team-mates to play a high pressing game - a new thing at Stamford Bridge. "The big difference with Chelsea is the pressing high from the front," he added. "Under Jose Mourinho and Antonio Conte they won Premier Leagues but sat off teams, which is not a problem, they were successful at it, but this is different." There was an example in that very first game against Huddersfield that highlighted the change when Jorginho went charging forwards to put pressure on his opponent and Chelsea succeeded in winning the ball back. "Very rarely do you see a holding midfield player go flying out at the opposition's holding midfield player," said Carragher. "More often than not he will hold his position and protect the back four. But Sarri said something to Pat Davison in an interview about defending - it's about the ball and not the man - and Jorginho knows that better than anyone. "This is what we are going to see all the time, this pressing from the front."